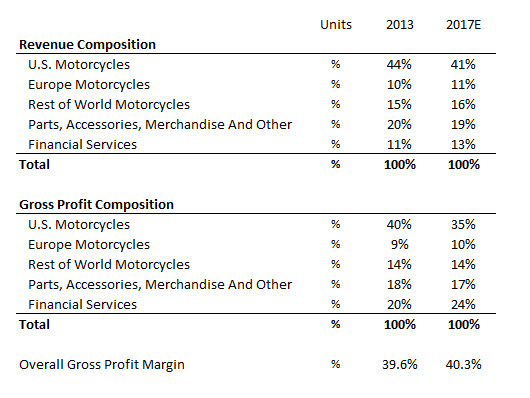 How Has Harley-Davidson’s Revenue And Gross Profit Composition Changed Over 2013-2017E? There hasn’t been a huge shift in Harley-Davidson‘s (NYSE:HOG) revenue and gross profit composition in the last five years, but the trend is telling. The U.S. alone forms approximately two-thirds of the motorcycle shipments for the company, and the decline in demand in the country’s heavyweight motorcycle market (601+cc) last year was detrimental to Harley’s overall performance. Harley’s retail sales declined 1.6% year-over-year in 2016, despite a 2.3% growth in international sales, due to a 3.9% decline in U.S. retail sales. Harley has looked for growth in international markets, whose contribution to Harley’s overall revenue is ostensibly rising. The U.S. heavyweight motorcycle market hasn’t filled up to the peak levels of 2005-2006, and it might not in the near future as well. This is primarily as the millennials are typically more price-conscious, especially after the recession, and are looking to hold off on making discretionary expenditures, which includes luxury heavyweight motorcycles. Customer spending also took a hit due to the growing uncertainty regarding the political scenario in the country. The company aims to add 150-200 international dealerships by the end of this decade, with 40 added during last year. This increase in reach and availability could help Harley replace the decline in the home market with more international sales.